That's right, Littlefoot! It is your month! In this topic please feel free to discuss Littlefoot as a character, to share your own creations (fanfics or fanart), or to mention some of your favorite fanworks of others involving this character. For a full set of rules please see the Monthly Character Showcase topic but keep in mind that this is meant to be fun as opposed to any sort of contest. Just to get things started I will pose an initial question to the Littlefoot fans on the forum: What about Littlefoot makes him your favorite character? That is just the perfect picture for Littlefoot haha! I agree with what Tails said here. Littlefoot instantly starts showing leadership skills as soon as things start going downhill. He might be a bit too stubborn for his own good sometimes, but generally knows what is the right thing to do. He cares so much for the ones who surround him and is willing to go the distance to help him. One of the most memorable moments for me was when he decided he was going to save his grandfather in the fourth movie. Going on such a major journey just to find a legendary flower is partially foolish and partially very brave. Can you imagine what the series would've been like if they had not found the flowers? Great act of heroism, right there. What made Littlefoot one of my favourite characters was the fact that I found him so relatable. In his leadership, brains and general friendliness. 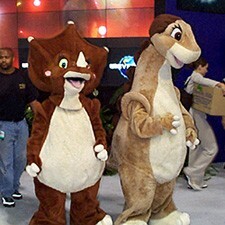 As I was growing up I often believed I could play Littlefoot but my voice was much higher then . I also found his flaws rather relatable as well which made him a very well rounded character with strengths and weaknesses. One of my favourite Littlefoot moments is in the original movie when he is encouraging everyone to continue climbing when they are all exhausted. It my have been a short moment but the thought of having someone who'd be there to keep you going when things are hardest is what I call a great friend. What do you think are his best and worst moments are. To me Littlefoot is worst in The Wisdom of Friends. I don't think I need to elaborate to much there. Also I have one art piece. This was my first Littlefoot art and the second or third LBT art that I had done but I never put it up as I found it to cringe worthy and embarrassing but regardless of that I'm going to put it up anyway. Also I have one art piece. This was my first Littlefoot art and the second or third LBT art that I had done but I never put it up as I found it to cringe worthy and embarrassing but regardless of that I'm going to put it up anyway. It can always be hard sharing an early artwork that you've done so thanks for sharing! So of course Flathead is flat out the best character in the franchise, due to his abilities to stay level headed in even the worst of times. OK, switching to being serious now. I happened to have the fortunate chance to watch the first LBT in theaters today and it's interesting to note that almost every time Cera is confrontational, both Ducky and Petrie are quick to take her side over Littlefoot's, resulting in a couple of times in which he is left alone. But even through all that he's always quick to move forward and do what he can to help out. I feel like he is the type of personality that one should aspire to be. I would easily say that that would be his best moment. As for worst moments...I think I'd go with XI on this one. The whole situation leading up to the introduction of the tinysauruses seemed pretty petty. And just for fun, here's another Littlefoot sketch. Those are some sweet drawings, Flathead! 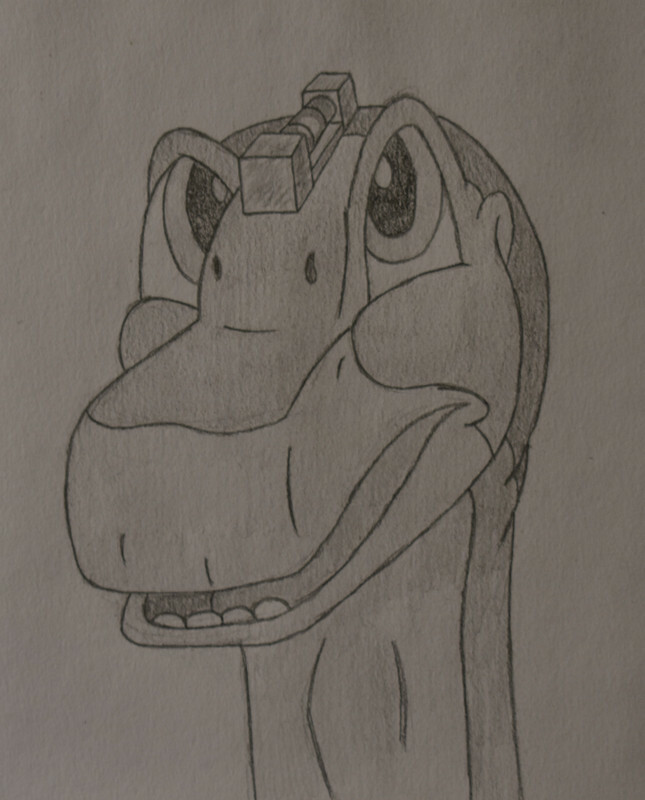 Since we are sharing artwork, I'll attach my first and last Littlefoot drawing too, haha. And my last sculpture of him too, just for funsies. Looking at my sculpture now (and the different layers used in sculpting), I am kind of wondering about the color gradient used for Littlefoot. Why is his back darker than the rest of his body? Is it actually a separate layer, or should these colors technically be merging into each other? And it's nice to see some of your drawings as well. 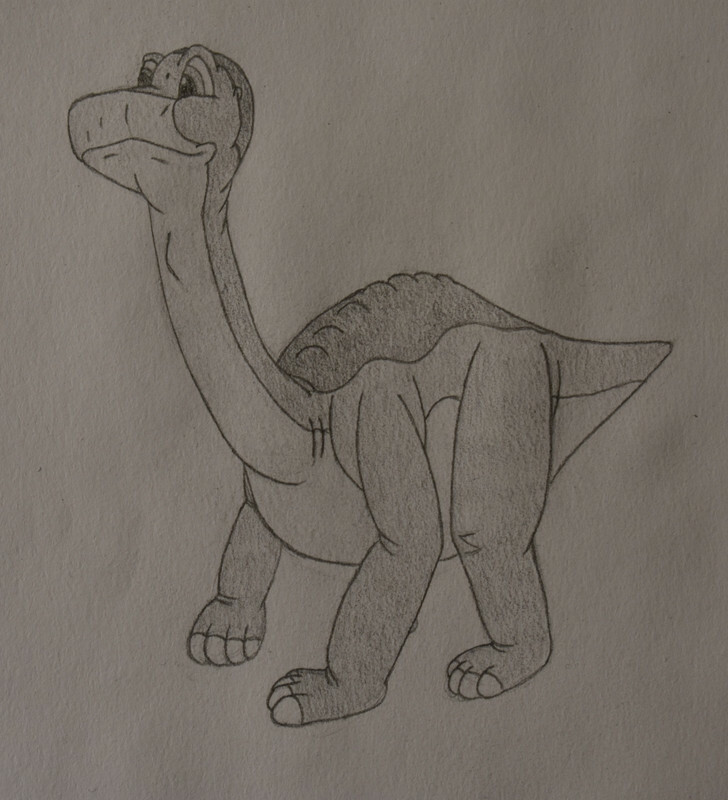 I really like the last Littlefoot drawing of yours! And Sneak, it's supposed to be one of those bubble levels used to show how straight/flat something is. Like in the attached photo. I am loving the artwork that has been displayed thus far. I laughed probably a bit too much at the Littlefoot drawing with a level on his head. But, in fairness to our favorite flathead, that does indeed make him the most level-headed of the gang. Getting to the Lone Dragon's questions, I think Littlefoot's best moment is when he stood up for Chomper in the second film. That one action showed that he put his empathy for a fellow orphan (so he thought at the time) over his fear or hatred over the kind who killed his mother. As for his worst moment, though hilarious, I think that was when he tried to get rid of the valley's bad luck by collecting a sharptooth's tooth straight from the source in the sixth film. Longnecks were not meant to be dentists. Great drawings, everyone! They are absolutely amazing! As for the topic, Littlefoot, of course, is one of my favorite characters in LBT for many of the same reasons that have already been mentioned. He is just intelligent and likeable enough to be a good main character for a series like this but his many inner conflicts and personal downsides prevent him from ever becoming too one-dimensional. That makes him a rather rare mix of a character which of course is a major upside for LBT as a whole. Even if he has had many times where his actions have been far from logical or relatable, most of the times he has earned his position as the films’ main character. As for his best moments, there have been many and as a matter of character, the scenes others have already mentioned, I always liked his mixed and torn motivations in the seventh film in trying to secure Ducky’s safety while also finding the truth about the Stone. Also, I like how he decided to keep the Rainbowfaces’ revelations to himself and his words about how much there still is to the world. Littlefoot is optimistic, but not careless. He is resolute and has a strong will. He proves that every time when he gets into an argument because of one plans. And if he makes a mistake, then he admits it. A very worthy ability that not everyone has. What characterizes Littlefoot the most, however, is his joy. 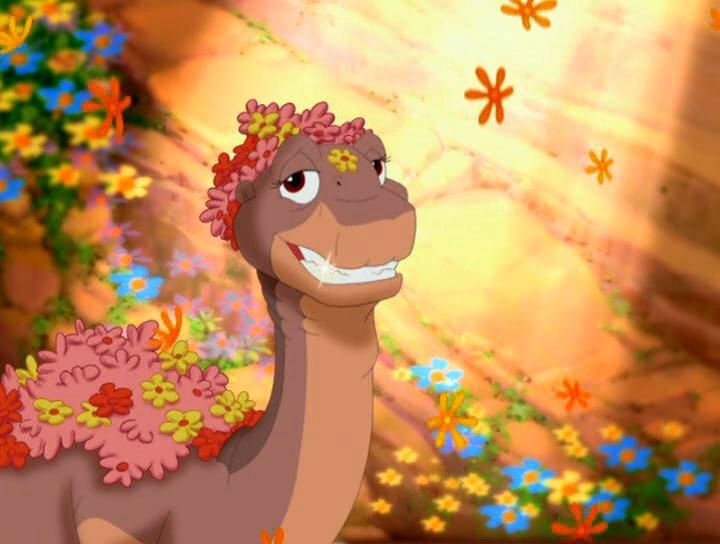 When I think of Littlefoot, I always think of a happy, laughing longneck. Gosh, I'm super late to this. Littlefoot is a character which I feel is just a good role model (XI aside haha). He has endless curiosity (maybe he'll be reborn as a cat lol) and boundless optimism, which is something that just a lot of people do not have in today's society. As the main character, he's not without flaws and has done his own fair share of stupid stuff being kids and all, but like Sovereign says he never really feels like a flat character, which is always a plus. He's like that one person in a sports rally cheering the team on from the sidelines. He's a good guy.